2 Wire Thermostat – Which one is the right choice? Different Types of Thermostats- Which Thermostat do you need? We all know what is a Thermostat and how it regulates temperature of the heating/cooling systems installed in our homes or office spaces. In this article, we see different types of thermostats and how they are classified based on its features & mode of operation. A Thermostat is basically a temperature sensor with a switch and a memory (to set the desired temperature). Based on the set temperature, a thermostat switches the HVAC system (heating/cooling system of your home) “ON” or “OFF” to regulate the temperature inside the room in which the thermostat is installed. So let’s see how many different types of Thermostats are available. Generally,Thermostats can be classified on two different basis. The first one is really technical and is based on the mode of operation of the device [Line Voltage & Low Voltage]. The second one is primarily based on the features & functions a thermostat offers [Smart Thermostats, Programmable, Non Programmable, Manual etc.]. In North America (especially in United States and Canada), majority of the people uses furnace for heating their homes. In most cases there would be a central furnace (fueled by natural gas, propane, wood or oil) and the heat produced in the central furnace is transferred to different rooms through a distribution system. This distribution system(running directly from central furnace) would be either a duct based system or a hydronic (radiator) system. As I wrote above, a big majority (may be around 80% ) of American homes runs on central furnace based heating systems. Such systems can be classified as “Low Voltage Systems” as they don’t use direct electricity to produce any kind of heat. The rest of the homes (roughly between 10 to 20%) in America rely on electricity based heating systems like baseboard heaters, wall heaters, forced fan heaters which converts “electricity” to “heat energy”. A mix of old & new homes (which may count in the range to 10 to 20 million) uses electricity based heating systems. Such systems are usually called as “Line Voltage Systems” as they operate directly on mains line voltage (120 volts or 240 volts). As already discussed, we classify thermostats on two basis. 1) Based on Mode of Operation and 2) Based on Features & Functions. Based on mode of operation, we classify into Line Voltage Thermostat & Low Voltage Thermostat. Based on features we can see Smart Thermostats, Programmable Thermostats, Non Programmable Thermostats & Manual Thermostats. Let’s see how all these types differ from each other. As you might have already guessed, Low Voltage Systems (houses running on furnace based heating systems or boiler based system or any system that don’t use electricity to produce heat) would be regulated using Low Voltage Thermostats. Line Voltage Systems (systems like baseboard heater which uses electricity to produce heat) would be regulated using Line Voltage Thermostats. 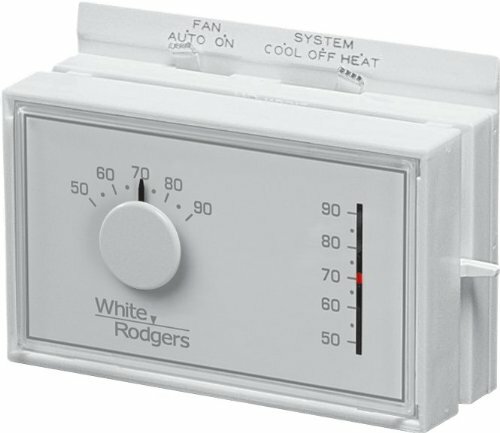 A line voltage thermostat is typically used with electric powered heaters like radiant, convection or resistance heaters. A fine example is baseboard heaters or wall heaters which are directly powered by electricity. A line voltage thermostat operates on your line voltage (that is 120 volts or 240 volts) and converts the electricity to usable heat. Line voltage thermostats are either Single pole (Two wire) or Double pole (Four wire) – which you can easily understand by looking at the backside of the thermostat. There will be either two wires (for a single pole thermostat) or four wires (for a double pole thermostat) coming out of a line voltage thermostat. These wires would be a combination of either Black & Red or Black & White. A low voltage thermostat is used with systems like a central furnace or boiler or a heat pump. So if your home is using a low voltage system, you should use a low voltage thermostat to regulate your heating system. The electricity usage for these type of thermostats are much lower compared to line voltage thermostats (as the heat is produced from central furnace/boiler and electricity is not used to produce heat). They typically run at 24 volts and they control blowers, fans and pumps (turning them ON/OFF) to regulate the temperature in different rooms. Remember a low voltage thermostat only control (switching) these parts like blowers/fans; thermostats do not power them. How to Identify your type of thermostat ? The most simple way is to observe your home heating system and then look at the backside of your thermostat. If your home heating/air conditioning system is central (a central furnace or boiler) and you have many ducts or pipes going through all rooms (starting from the furnace/boiler) you should be having low voltage thermostat in your home.Now when you look at the backside of your thermostat, if you see 6 or more wires (thin, multi colored) in its back (going into a board) you can confirm you have a low voltage thermostat. A line voltage thermostat is used only with single stage heating systems (like forced fan heaters or baseboard heaters) and their will be only either 2 wires or 4 wires coming out of its back. These wires will be thick (as they carry higher current & voltage) and often will be in a combination of Black & Red or Black & White color. Well, this is the most important classification when it comes to types of thermostats. In fact, there are only two types of thermostats – either low voltage or line voltage. The other classification (based on features) which brings in Smart Thermostats, Programmable, Non Programmable etc. applies to both line voltage and low voltage thermostats. Smart Thermostats are available for both low voltage & line voltage categories. Similarly, programmable & non programmable thermostats are also available in both categories. So lets see which all are the best models available for both categories and how they differ. Save Energy Bills – The very first and most important advantage of a smart thermostat is they “save energy bills” like none. The key highlight in the marketing words of a smart thermostat is “you can get the money invested in a smart thermostat back in 2 to 3 years” as savings in your energy bills – how good is that ? And you heard it right! Smart thermostats are very energy efficient and they learn your schedules to save maximum energy always. Control from Anywhere using Mobile Apps (WiFi Control) – All smart thermostat models comes with a mobile app which you can install and control from anywhere in the world (thermostat should be connected to your home WiFi network). If you are coming a little earlier than usual, you can turn your heater ‘ON’ using your mobile app and make the room warm when you arrive. Similarly you can control your thermostat from any rooms or even your outdoor or any place where you have internet connectivity. Voice Control – Almost all latest models of Smart Thermostats now comes with voice based control enabled. Most of them are compatible with Amazon Alexa or Googe Assistant – which makes it much easier to control your thermostat while you are still bed half sleepy (you dont need to search your remote or mobile app). 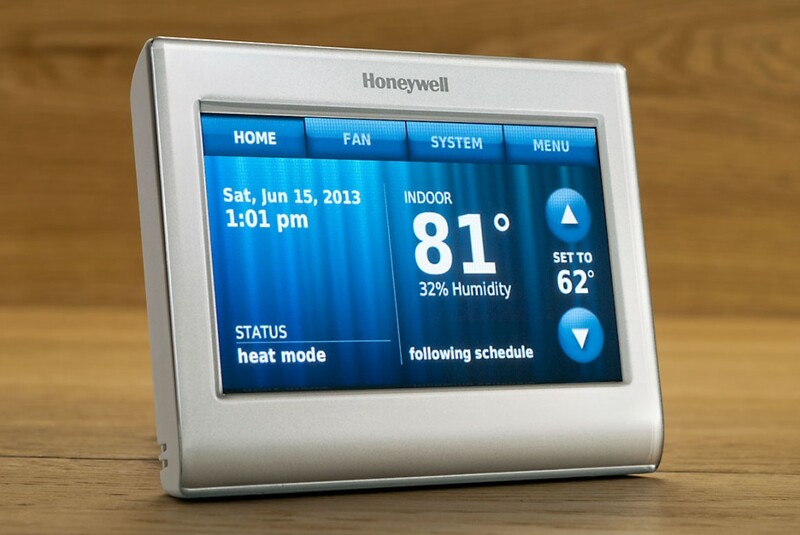 Easily Programmable – Smart thermostats have a really good user interface (intuitive screens). They are very easy to program & schedule. Learning Ability – Smart thermostats can learn your schedules/preferences and program itself to save maximum energy. Just think how good it would be if your smart thermostat can detect you’ve gone out of your home and turn off the heater/air conditioner that you had left ‘ON’. Learning ability is one of the key feature which makes smart models stand out from all other types of thermostats. Apart from all the highlighted features above, smart thermostats provide email updates (about your energy usage, temperature rise and fall beyond set levels and other essential data), monthly reports of energy usage & savings, vacation mode (set your preferences while you’re away) etc. Smart thermostats offer a lot of useful features but they are highly priced as well. The best selling models like Nest, Ecobee are priced in the range of 200+ USD. Well, features & high end technology always comes with a price tag. In any case, a smart thermostat is worth the investment as they can pay for themselves (as energy savings) in the long run. Let’s see the best smart thermostat models for low voltage systems (heating systems using central furnace or boiler or heat pump etc) which requires low voltage thermostat model. #1 Nest Learning Thermostat – is the most popular smart thermostat model for low voltage systems like central furnace or boiler or heat pump based heating/cooling systems. Nest thermostat is self learning (which learn from your living habits) and programs itself automatically. Nest thermostats also have WiFi, smartphone control, voice control, and a lot of other useful features. Read our review of Nest Thermostat and compare Nest 3rd Gen vs Nest E (budget model). 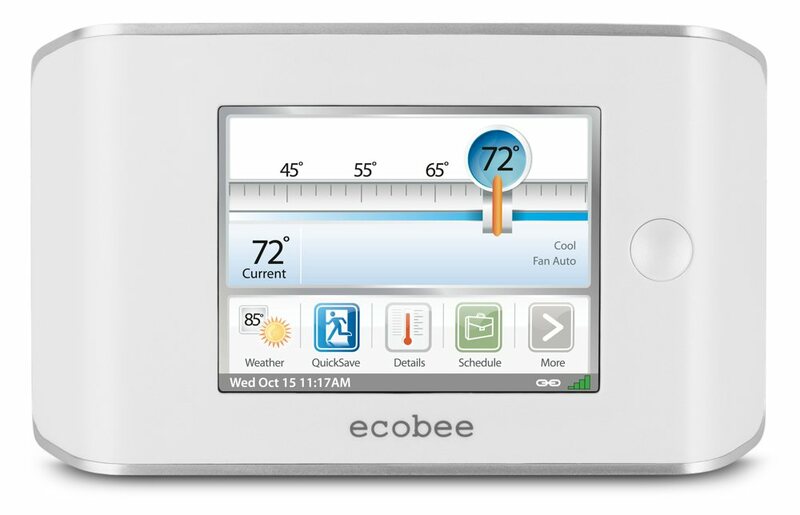 #2 Ecobee Smart Thermostat – Ecobee is one of the best selling smart thermostat model. They have two model in market Ecobee 4 (full feature version) and Ecobee 3 Lite (budget version) to choose from. Ecobee is equally competent with Nest thermostat models and are priced a little lower than Nest. Read our review of Ecobee smart thermostat and compare the two models – Ecobee 4 vs Ecobee 3 Lite. Let’s see the best smart thermostats for single stage heating systems (heating systems like baseboard heaters or forced fan heaters etc) which require line voltage thermostat type. A low voltage programmable thermostat helps you to have the temperature in your house adjusted automatically according to preset times. This will help you conserve energy as you can allow the device to minimize the temperature when you are away from home and maximize the temperature when you are around. Here in thermostatguide, we have written the best reviews of touchscreen thermostats.Read our detailed review about programmable touchscreen thermostats. 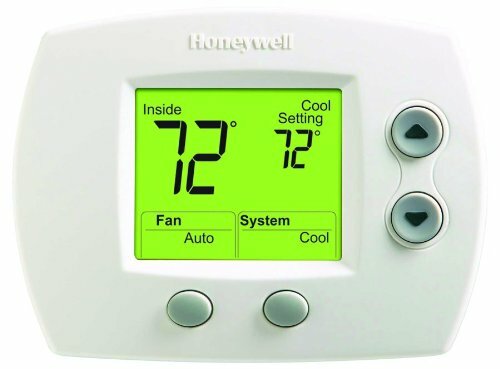 These thermostats are available in several models. Simpler ones enable you to program different daytime and nighttime temperature settings whereas the complicated ones can be programmed so that they adjust temperature in different ways for the various days and times of the week. What are the best Programmable thermostats right now? The best smart wifi thermostat available right now in the industry, if you are looking for something that is extremely smart,intelligent, and money/power saving you can buy the new generation Nest learning thermostat.. You can save great deal of money by using a thermostat, check this and find out how you can really save money by using a nest smart thermostat. If you are looking for something similar to Nest learning thermostat, and at a cheaper price, you can try the Honeywell Smart wifi thermostat. 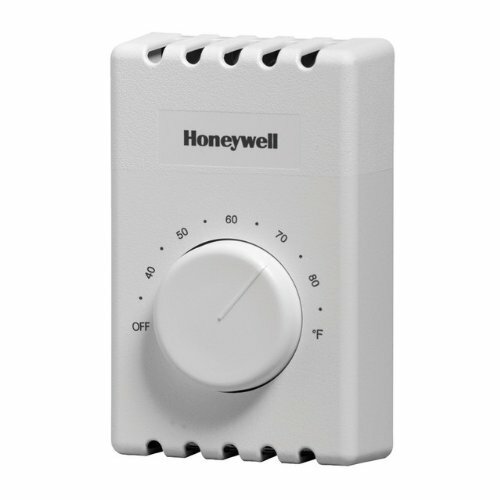 You can also get Honeywell thermostat in multiple colors. Are you looking for a smart wifi thermostat with almost all the functionalities of Nest learning thermostat and honeywell smart thermostats, but at a lower pricing? Well, what are the benefits of programmable thermostats? Whenever there in an increase in temperature variation, loss due to heating and cooling from a building becomes greater. However, a programmable thermostat helps in reducing these losses by reducing the temperature variation. For instance, in the cooling season, a programmable thermostat may be set in such a way that the temperature rises during the workday when no one is at home and set to turn on the air conditioner just before the arrival of the residents; this makes the house to be cool when the residents arrive at home while still having saved a considerable amount of air conditioning energy during the peak outdoor temperatures. In addition, the reduced cooling needed during the day minimizes the demands placed upon the electrical supply grid. On the other hand, during the heating season, this thermostat may be set in such a way that the temperature in the house drops when no one is at home during the day as well as during the night when all of them have gone to bed; it should also be set to re-heat the house prior to the time the residents arrive home in the evening or wake up in the morning. As a majority of people sleep comfortably when a room is cooler and the difference in temperature between the outdoors and indoors is greatest on a cold winter night, this significantly reduces energy losses. 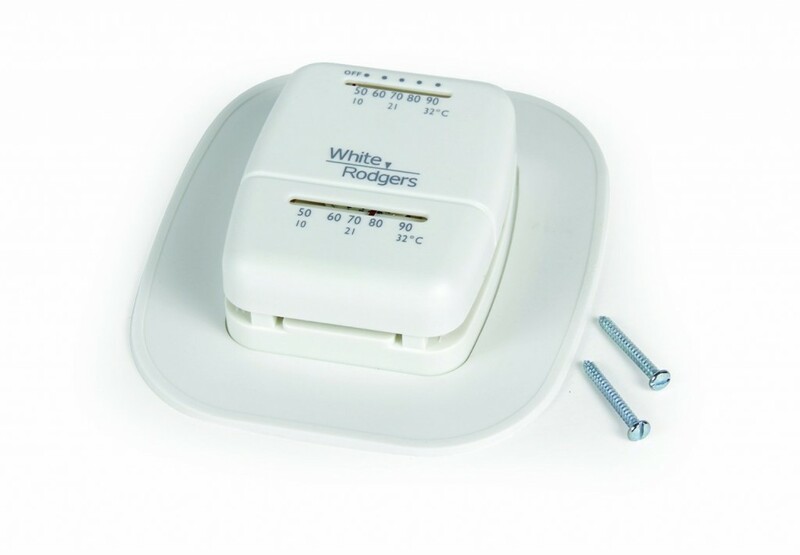 These are a type of line voltage thermostats that are pretty easy to install. These thermostats operate by being triggered by metal bars that heat up or cool down. In fact, these are the easiest and the cheapest thermostats available. They have either vapor-filled bellows or bi-metallic strips that respond to differences in temperature. However, mechanical thermostats are thought of as unreliable, especially the cheapest models that use bi-metallic strips. The major drawback you will experience with mechanical thermostats is the slow response of the bi-metallic strips that may cause significant temperature variations, above or below the desired set points. Moreover, these thermostats can be set only to one specific temperature. These thermostats are generally referred to as old fashioned thermostats mainly because they are not programmable and they are not very efficient in regulating a room temperature like a digital thermostat. Besides being the oldest type of thermostat, many people still use it merely because these are quite simple to install and use and above all, very cheap. You can see this type of thermostat particularly in older houses. Mechanical thermostats are provided with coiled metal that expands or contracts according to the temperature. Well, this is certainly not the best way to control temperature even though it has been sufficient for most of the people over the years. Still, these thermostats result in incorrect temperature readings and it has been noted that they keep the temperatures higher than the set point. With everyone concerned about energy savings, it is important to remember that whenever your room temperature goes up by 1 degree Celsius, you end up using up to 10% more energy! Therefore, this thermostat is not a choice for those cautious energy savers. Yet another disadvantage of using this mechanical thermostat is the slower response time that results in wider temperature fluctuations as the day passes. 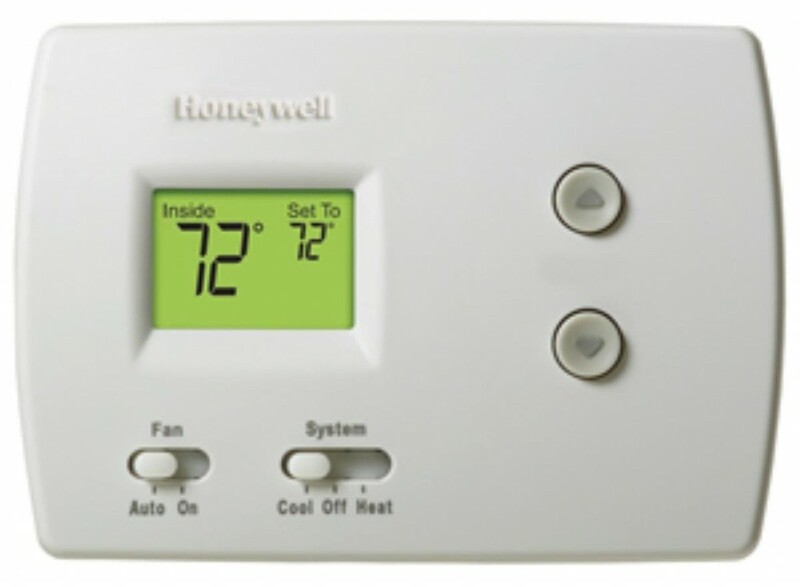 When it comes to non programmable mechanical thermostats, Honeywell CT410B is thermostat with highest demand. This is a non programmable mechanical thermostat with bi metallic strip. Another bimetallic strip non programmable mechanical thermostat which is useful for certain purposes. Non programmable digital thermostats are other kind of thermostats that can be controlled with a digital display. 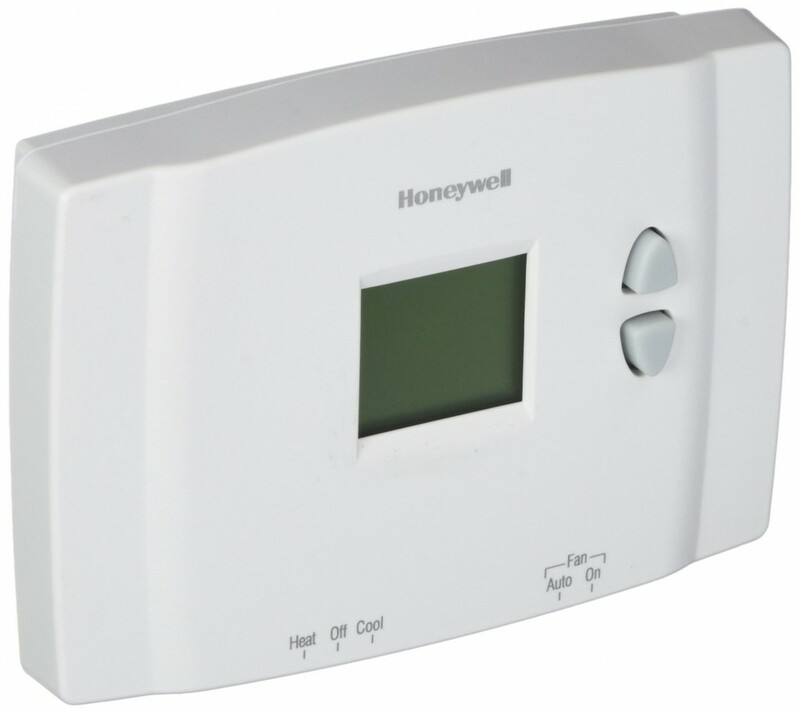 When it comes to non programmable digital thermostats, honeywell TH3110D1008 is the best and popular one in the industry. Lets have a look at some of the important features and specs of the honeywell TH3110D1008 digital thermostat. Simultaneous display of current and set temperature. Accurate- Consistent comfort is provided with high level of accuracy. Slide switches – Slide switches makes your selection of heat/cool mode very easy. Weight – Weight of the thermostat is 1 Pound. Color- Premier white color gives it the standard look. Country of Origin – Mexico. Battery – Battery is included along with the thermostat. Installation guide- Very much straightforward and simple, it should take hardly 15 minutes for an amateur to install the honeywell TH3110D1008 non programmable digital thermostat. Honeywell RTH111B1016 is another non programmable digital thermostat to consider as it as a digital thermostat worth all the money you give. Retains the set temperature, even if a power outage happens. Color : white in color. Good battery life of 8760 hours. This non programmable digital thermostat offers all the essential features with good performance and energy savings. Very large backlit screen is one of its biggest specialties. It also displays the room temperature and set temperature .Application: up to 1 heat/1 cool conventional systems and heat pumps with no auxiliary heat. Dimensions: 3-7/16 ” (Height) x 4-1/2 ” (Width) x 1-5/16 ” (Depth) horizontal mounting. Display size of 1.5 square inches. Dual powered(using battery or hardware). Most electronic thermostats fall under the low voltage category; however, you can have them for line-voltage purposes as well. These devices contain a sensor that can detect when the temperature moves above or below the desired room temperature. Many of these thermostats are programmable as well. Dissimilar to their mechanical counterparts, electronic thermostats use electronic gadgets to detect temperatures and consequently initiate control over your heating or cooling systems. They exhibit much quicker response time to temperature variations. In addition, these devices offer you a lot of convenient features like automatic setback and programmability. Therefore, electronic thermostats are more expensive than the mechanical ones. Low voltage electronic thermostats can keep a room at the particular temperature as desired. There are varied types of electronic thermostats available on the market. There are simple electronic thermostats that do not have any programming capabilities. On the other hand, there are programmable electronic thermostats that are loaded with features for controlling the heating or cooling systems of your home in a much more efficient manner. Non programmable electronic thermostats function similar to the mechanical thermostats; the major difference is the metal coil in the mechanical thermostat is replaced by an electric temperature sensor in this device. A tiny microprocessor that is set inside this thermostat sends ‘start’ or ‘stop’ commands to the heating or cooling system based on the reading it takes and the chosen temperature setting. In fact they are more accurate than the mechanical alternatives, but, you have to set the favorite temperature manually and make necessary changes during the course of the day manually.